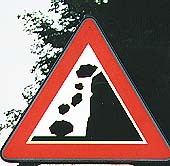 German boulders act as good children of their nation: they strike fear by their size. The 5-stone version is most common. Don't miss the stone already down; this is rarely seen. Visit Portugal and Spain for other examples. In both countries the boulder has been deformed by the impact. 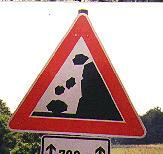 The German roadsign-artist froze the movement on the very moment of touchdown, before any distortion.